It’s common knowledge by now that Samsung will be unveiling the Galaxy S10 on February 20 in San Francisco. The company was already expected to open up pre-orders the very next day. It appears that Samsung will indeed allow you to pre-order the Galaxy S10 on February 21. Reports have suggested that Samsung will release the handsets on March 8. That’s when pre-order customers will receive their shipments and retail customers will be able to walk out of a store with one. You’re probably confused why the Unpacked event date on this poster is February 21. Take a look at the time, the event will be at 2 AM local time. That means it would be 11 AM, February 20 in San Francisco. That is precisely the time Samsung’s event kicks off. 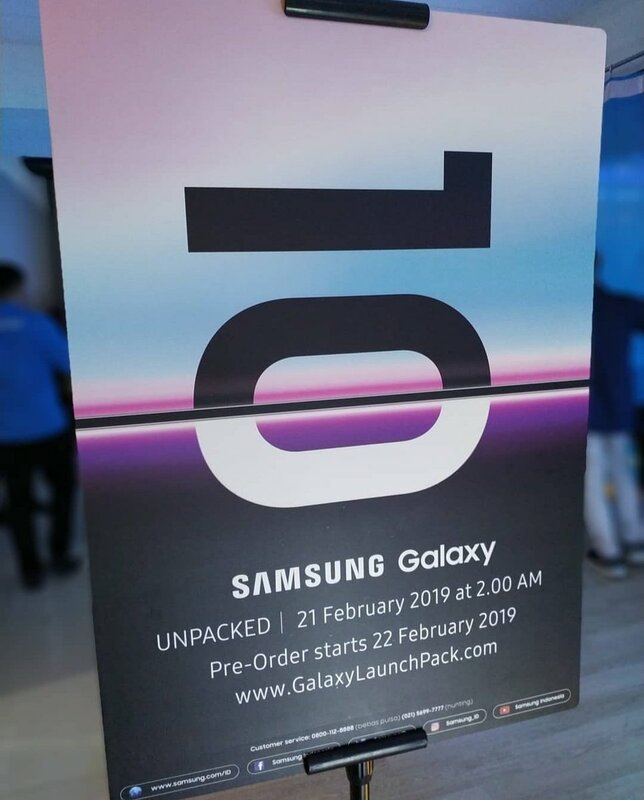 Consequently, the February 22 pre-order date for Indonesia means that customers in the west will be able to pre-order Galaxy S10 on the very next day after the event. This poster also has a link to the www.GalaxyLaunchPack.com website. There’s nothing on there yet except a time which is counting down to the event. It’s a local site from Samsung Indonesia where fans can register to receive more information about the device when it’s announced. There wasn’t any concern that Samsung would make fans wait a few days to pre-order Galaxy S10 after the event. Nonetheless, this poster is reassuring. Samsung will be unveiling three models of the new flagship in San Francisco. They include a cheaper Galaxy S10e, Galaxy S10 and the Galaxy S10+. In the last two years, the pre-orders for the S8, Note 8, S9 and Note 9 were immediately open after the event, so I think it will be the same with the S10. When they announced the S8 I was able to pre-order direct from Samsung UK within an hour. This has been the case almost every year these past few years so I wouldn’t be surprised. I’ll be curious to see, however, if they’ll do any trade-in program like last year. ’cause at the prices these phones will ask, they’ll definitely need it. Offering gifts with the phones won’t be enough to push them out. That may very well be the case, getting a few hundred dollars for your existing phone should make the price tag more palatable. Definitely. I mean, last year they were giving up to 400€-450€ (can’t recall) for people trading in the S8 and S8 Plus and the iPhone X (though no one did that trade in, obviously lol). Considering the prices they’re going to ask for the S10 line…I’m curious to see how much will they give for the S9 line. It’ll have to be at least 100€ more than last year to make it even slightly appealing. Is there any gift if you pre-order the phone? No one knows, it isn;t even announced yet.